Welcome to this web page, dedicated to my house and named after my first grandchild, Charlotte (°1993).Casa Charlotte is situated in the historical centre of Nerja, in the neighbourhood of many authentic tapas bars and restaurants. It’s an original Andalusian house, which has just been entirely re-designed and modernised into three luxurious apartments. The ground floor apartment, has complete facilities for the disabled. Pets, or smoking inside the apartments, is not allowed. Each apartment has free Wi-Fi, washing machine and a dishwasher, refrigerator w/freezer, iron and ironing board, hairdryer, HD TV, HiFi installation with a selection of CDs, DVD player, air conditioning and electric heating in the winter. There are also bathroom towels, beach- and tea towels. The kitchen is very well equipped: nothing is missing! If something should be missing then we take care it will be in the apartment in a short time. You’ll certainly enjoy the beautiful sight of the sea and of the mountains from the splendid roof terrace on the third floor. Casa Charlotte is only 5 minutes walking distance from the Burriana beach, the bus station and many restaurants and shops. Barely 10 minutes away is the well known and beautiful Balcón de Europa. As a result of the recent renovations, each apartment offers the best quality possible: king size beds, fine linen, good tableware etc. 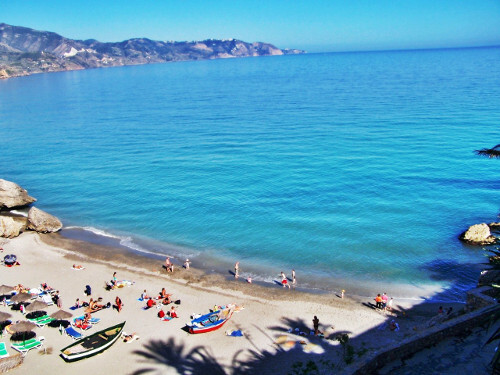 If you want to have a comfortable time on the Costa del Sol, you should consider coming to Nerja and the Casa Charlotte.